Let’s face it. Some people are just flat out scared to go to the dentist. Common anxieties that come up are around fear of pain, embarrassment or a bad past experience. 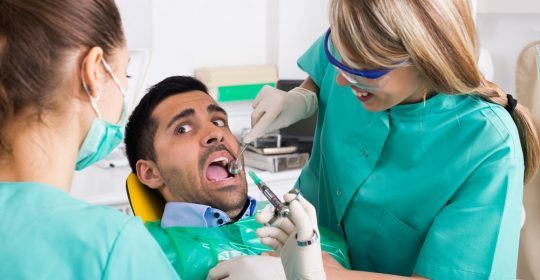 So, if you’re someone who dreads your checkup, read up on these tips for curbing your fear of dentists. Step one to conquering your fears is to acknowledge the fear. As cliche as it sounds, it’s an important step in the process. Acknowledge the fears you have will help you determine how you’re going to tackle them. If you’ve had a bad past experience at the dentist, communicate with your dentist your concerns and request reassurance. Dental care professionals are trained to settle your concerns and reassure you about the treatment process. Communication is the key to resolving any conflict. Dental anxiety is common amongst patients seeking treatment. You won’t be the first and definitely not the last. If you have any reservations, communicate your concerns with your dentist. There is a chance your dentist isn’t the right one for you. The right dentist will listen to your concerns and work with you to sort out your treatment. No harm in ringing around. Calming your anxiety is easier said than done. Relaxation techniques are your best bet to calm nerves before a dental appointment. Sedatives should be a last resort. But they are an option. If you’re unable to use relaxation techniques to ease your anxiety, ask your dentist about sedatives. With sedatives you’ll be put to sleep during the treatment and woken up when it’s complete, or your dentist can provide you with the green whistle to help settle your nerves. Sometimes you just need a friend to hold your hand and reassure you it’s going to be okay. If you’re anxious about your treatment, ask a friend or family member to come with you. A companion can sit with you in the room during the treatment. Dental phobia is a very real thing and can take a lot of mental strength. A reward system is a great incentive to get you through the treatment. When you’re feeling anxious, remind yourself you have something great waiting for you – but only if you get through the treatment! Anxiety is different from person to person. Not all advice will suit every individual. At Redbank Plains Dental, your local Ipswich Dentist, we’re here to help with all your dental health needs. To find out more about our services, contact us today. I have chopped my back molar badly and I was wondering how much you charge for fillings? Also if you allow payment plans?